It is a sad point of societal evolution that men’s clothing, particularly formalwear, has, in modern times, become almost a uniform. Black tuxedo, white shirtfront, collar, cuffs and cravat…ok, “tie,” but cravat better fit my alliteration. Mindful of that, I have become a devotee of the cufflink. The right cufflinks are, to me, the perfect finish whether you’re in jeans or white tie and tails. Therefore, having a variety is important. And so, some years ago, I began yet another antiques collection. Cufflinks, however, are one of the easiest and most economical antiques to collect. They’re everywhere because, I suppose, people aren’t wearing French cuffs as much as they used to (Why?! What is happening to the world?). These tiny treasures of the erstwhile sleeved-and-civilized simply litter antiques shops…largely because many are so terrible (I said it was easy. I didn’t say it was effortless). That said, many are so terrible, they’re wonderful. Now, of course, you can seek out jeweled sets by known makers of the Cartier or Tiffany ilk…and who’s going to argue that those aren’t great? But there are untold numbers of less-pedigreed pairs that are incredible. I have found sets for as little as $20 and I have paid as much as $200. Loving something makes both of those numbers okay for me. 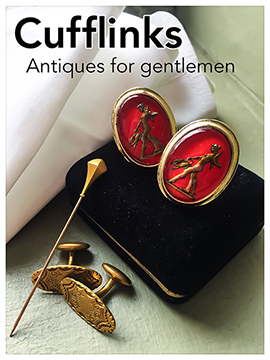 I’ll wear a gaudy pair of 1970’s cufflinks that I found in a thrift shop or the enormous rose gold and red lacquer 1940’s links featuring Diana, the huntress, that I bought in a fine antiques show. They are a singular statement of their own. My best advice for starting an antiques cufflink collection is: Buy what you like and don’t be afraid to try something that seems over-the-top. Remember, it’s only on your wrists, not on your head. Price should be reflected in quality and condition. Look for damage and make sure the stud (the part that goes through the cuff) is secure and works properly. Beyond that, go crazy. I must warn you, it’s a delightful little addiction…and, if you’re lucky, you might find a Victorian set like mine with the matching stickpin for your cravat! Palm Beach Show Group is holding its LA Art Show through Sunday, January 31. Their next show, the Palm Beach Jewelry, Art & Antique Show will be held February 10-16. The last show of the season, the Naples Art, Antique & Jewelry Show, is February 19-23.